American women, as a whole, are waiting longer to get married and have children. And more of them than ever are choosing to freeze their eggs during their most fertile years with the hopes of improving their chances of being able to get pregnant later in life. This fertility technology has been praised for enabling some women to take pressure off their “biological clock.” But fertility experts want to make sure that women receive enough education about the uncertain outcomes of egg freezing and the risks of waiting to have children. It’s a decision that requires careful consideration and realistic expectations. Here’s a look at how it works. Why do women freeze their eggs? There are two common scenarios in which women choose to freeze their eggs, Dr. Flyckt explains. The first is if they are about to undergo chemotherapy of another medical treatment that could delay childbearing or be toxic to their ovaries or eggs. The other scenario is elective egg freezing. This is when women delay getting pregnant for non-medical reasons and want to have options when they are eventually ready to start a family. However, it’s not guaranteed that those eggs will lead to pregnancy. “It’s a good technology, but it’s not a perfect technology,” Dr. Flyckt says. What happens when you freeze your eggs? Once a woman decides to freeze her eggs, the process takes a couple of weeks. It starts with a learning visit with a fertility specialist, who explains a series of hormone injections that will encourage multiple eggs to mature in the woman’s ovaries. During follow-up visits, care providers will monitor the ovaries and eggs through ultrasound. When it’s time to collect the eggs, a woman has a one-time procedure that takes about 15 to 20 minutes under anesthesia. It’s done vaginally using a tiny needle that goes into the ovary to collect the eggs, Dr. Flyckt explains. It’s not painful, and she goes home the same day. The eggs that are collected (amounts vary, but it’s usually around 10 to 12 eggs) are then frozen and stored indefinitely. Women may choose to do multiple cycles of egg collection if they want to store more eggs to increase their chances of pregnancy later. Most women don’t actually end up returning to use their frozen eggs, Dr. Flyckt says. In that case, those eggs can be thawed and discarded, or donated to research or to another couple. If a woman does end up wanting to use her eggs later, they are thawed and then fertilized with sperm from a partner or donor to create an embryo. The embryo develops in a lab for five or six days, Dr. Flyckt says, and then is implanted into the woman’s uterus during a minor procedure that feels like a pap smear. It’s likely that not all of the eggs will survive the thawing process, though. Others will not fertilize. Others fertilize abnormally, and still others don’t “take” in a woman’s uterus. It’s estimated that each egg that a woman freezes has about a 4.5 percent to 12 percent chance of becoming a baby someday. 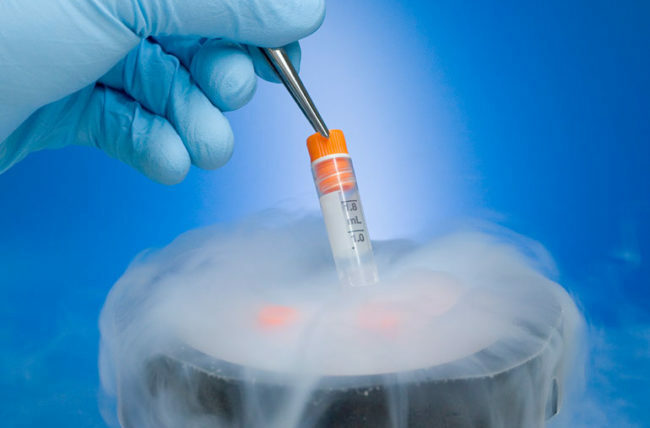 While some insurance plans may cover medical or elective egg freezing, most of the time that’s not the case and it is paid for out-of-pocket, Dr. Flyckt explains. It typically costs around $10,000 to $12,000. That includes the tests, labs, ultrasounds and the procedure – everything except an annual storage fee and the follow-up procedure for women who end up using those eggs. Some tech companies, including Apple and Facebook, have made headlines for offering to cover the cost of egg freezing as a perk for employees. It’s a progressive move, but experts like Dr. Flyckt wonder if it’s a bit of a double-edged sword.